Indexed Sequential Access Method (ISAM) record access technology has been proven over many years. It remains a technology of choice for high-performance applications due to its high throughput and low cost of maintenance. Structured Query Language (SQL) refers to any database management technology that utilizes this ANSI/ISO industry-standard access method. FairCom’s unique competitive advantage is in providing both ISAM and SQL access to data concurrently. By providing interfaces directly into the ISAM storage engine, a developer can avoid the performance overhead of SQL processing. This unparalleled flexibility allows application developers to choose the degree of relational control they require to efficiently implement their requirements. The end result for you is the best possible performance with the richest feature set. For information about enhancements in the many interfaces supported by c-treeACE, see Interface Developments and c-treeACE SQL Advances. c-treeACE SQL provides a high-performance SQL interface into the proven core of the c-treeACE Server. Tailored for high volume production environments, the c-treeACE SQL Server includes optimizations such as sophisticated query rewrite techniques to improve nested query performance and join-order optimization to improve performance of queries joining many tables. c-treeACE SQL extensively caches and buffers information for maximum transaction and query throughput. Because c-treeACE SQL is built on the same core technology as the c-treeACE Server, you get all of the performance and features that distinguish c-treeACE with the additional benefits of a functionally-complete SQL interface compatible with SQL-92, ODBC 3.0, and JDBC 3.0 standards. c-treeACE SQL provides embedded SQL and interactive SQL utilities, as well as ODBC, JDBC, ADO.NET, PHP, and Python drivers. c-treeACE SQL also supports stored procedures, triggers, and user-defined functions utilizing the powerful and extensible Java language. 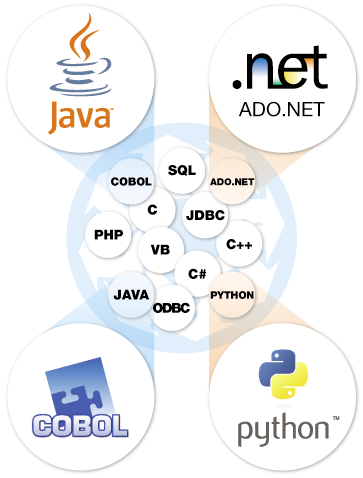 FairCom’s c-treeACE SQL supports most of the major platforms including Windows, Linux, Mac OS X, HP‑UX, Solaris, and AIX. Additional ports to other operating systems are constantly ongoing, so please contact FairCom for the latest status of your operating system of choice. For more information, see c-treeACE SQL Advances.